The activities of an international NGO is under government scrutiny following revelations a hospital in rebel controlled Ampara, which came under the control of the STF on Monday, was being funded by the charity group. According to sources the defence ministry was to hand over a report to the foreign ministry pertaining to their findings regarding possible links between the Netherlands based Zoa Refugee Care (ZOA), and the LTTE which will be scrutinised before the next course of action is taken. The Daily Mirror learns logos of the NGO were found on several items of equipment in the rebel hospital at the ‘Stanley Camp’ in Kanchkidichcharu Ampara, a key rebel camp in the area which was overrun by the STF in an operation on Monday. “This maybe a plant and we are still not sure if there are any links. All we know is that the logo was found on several items in the camp,” a Defence Ministry source said. However ZOA officials in Colombo said they were surprised at the allegations and were attempting to obtain more information over the alleged findings. “This is not true. We have nothing to do with the LTTE. We are awaiting further details on this issue,” ZOA country director Bernard Jafperf Faijer told the Daily Mirror. ZOA is active in Ampara in the east with its local head office based in Colombo and according to Mr. Faijer the aid group operates an office 7 km away from Kanchikudichcharu, the location where the alleged ZOA branded items were found. ‘Stanley camp’ in Kanchikudichcharu was the main centre used by the LTTE to continuously carry out attacks on the security forces positioned in the area. 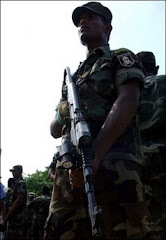 In addition this was also the main centre to train the forcibly recruited children by the LTTE and had also housed a large number of child soldiers.